DEAD-HOLD BDC RETICLE: Customized dot design helps eliminate guesswork on holdover and windage corrections. Good for hunting/shooting at varying ranges where estimating holdover is a concern. 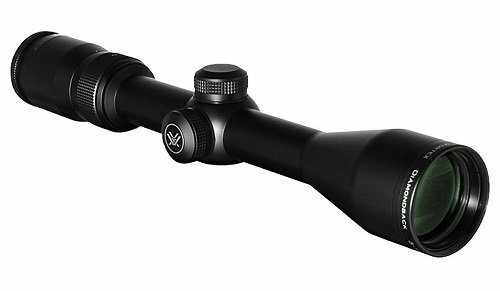 Vortex Diamondback 3-9×40 Riflescope The Diamondback-loaded with features. First, the solid one-piece aircraft-grade aluminum alloy construction makes the Diamondback riflescope virtually indestructible and highly resistant to magnum recoil. Argon purging puts the waterproof and fog proof performance on the agenda, and advanced fully multi-coated optics raise an eyebrow when crystal clear, tack-sharp images appear in the crosshairs. Look for all this and more in a riflescope you’d expect to cost quite a bit more-but doesn’t. We can live with that. 3-9×40 riflescope is ideal for big game, muzzleloader, and slug shotgun applications. Capped Reset Turrets: Allow re-indexing of the turret to zero after sighting in the riflescope. Caps provide external protection for the turret.